Though most commonly associated with Japanese food, tempura batter (also spelled tenpura) is actually Portuguese in origin. Regardless of where it came from, this style of batter is now used by chefs cooking a huge variety of food across the US. They love it because it provides a thin, irresistibly crunchy layer and allows the colors and flavors of the food to shine through. Several variations of tempura batter exist with ingredients ranging from low-protein wheat flour, rice flour, other starches, spices, sparkling water, flat water, to baking soda or baking powder. Heat the oil in a fryer, heavy deep pot or Dutch oven to 375 degrees. Make the batter by lightly mixing together the egg yolk (beaten), sparkling water, salt and pepper and the rice flour. If it’s too thin, add more flour, if it’s too thick, add more water. You want it to coat your food in a thin opaque layer. Dip what you’re frying in the batter. If the batter isn’t sticking to the food easily, lightly coat the food with rice flour before dipping. Immediately fry in the oil until lightly golden brown. Drain the fried food on paper towels while battering and frying any additional batches. Serve with your condiments of choice. 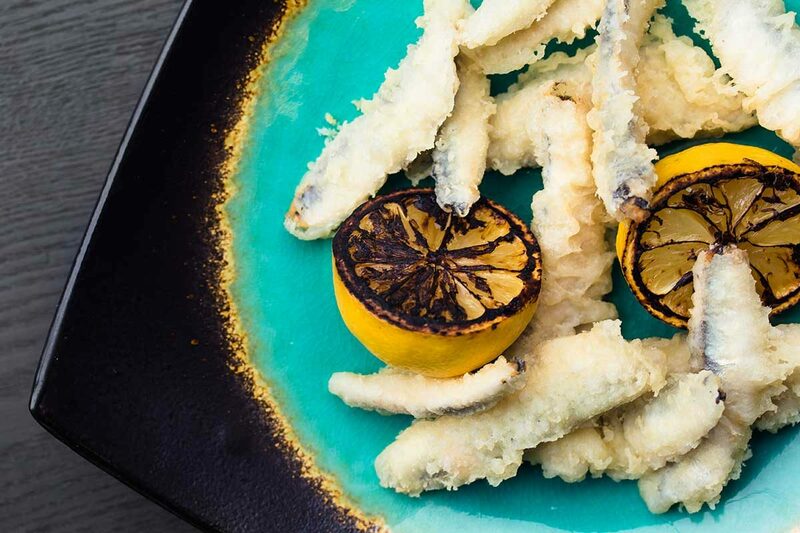 Time: Tempura batters like this one rely on the effervescence of sparkling water for their extra light texture, so they should be cooked as soon as possible. Temperature: Fry your battered goodies in oil that is as consistently 375 degrees as possible. Don’t overcrowd your pan or fryer, lest the oil temperature drop. Let the oil temperature come back up to 375 (if necessary) after each batch. The water used for tempura batter should be as cold as possible.